"December 9th this year is the 24th anniversary of the First Palestinian Intifada. 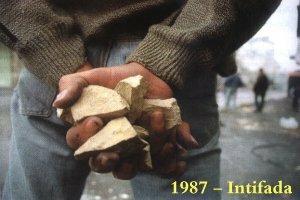 We, a group of Palestinian youth, children of the First Intifada, bow in front of the heroes of the Intifada, its martyrs, children, elders, women and men. We view the Intifada as a significant era in the history of the Palestinian people that future generations need to learn from, and that many have used as a model in their struggle for justice, dignity and freedom. On this occasion we affirm our belief in the Palestinian Popular Resistance, as a principal part of our struggle for freedom and Palestinian rights that is not open for compromise. We support the struggle to achieve freedom and the right of return. Based on that, we are calling out to all our people in Palestine and in exile to commemorate this anniversary, by honoring the heroes of this Intifada and to follow in their footsteps. We are also calling out to all the Palestinian bloggers in Palestine and in exile to dedicate their blogs on the 9th of December to honor the people of the First Intifada through writing stories from the Intifada or conducting interviews with the heroes, publishing videos or photos etc. We also call on Palestinian artists for a dedication in honor of the Intifada. Long live our people and long live Palestine.